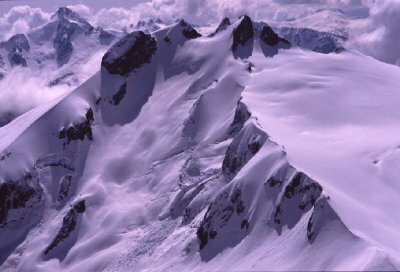 The Nooksack Traverse begins from Mount Baker Ski Area, with an ascent of the White Salmon Glacier to the summit of Mount Shuksan. 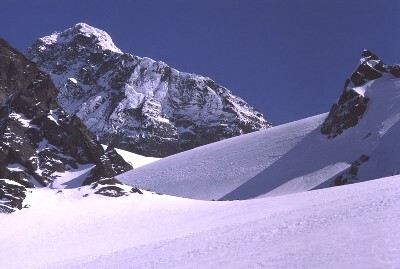 Then a descent and traverse of the Nooksack Glacier leads to Icy Peak. 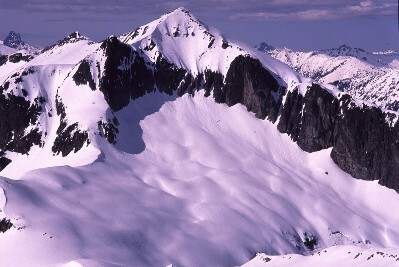 From Icy Peak, the traverse finishes over Ruth Mountain and exits Ruth Creek. 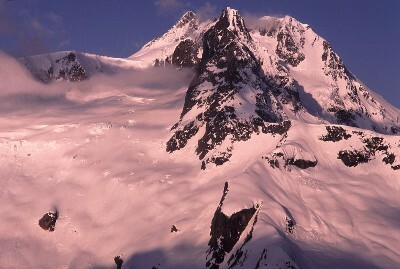 Sunrise on Mt Shuksan, taken from between Ruth Mountain and Icy Peak. The Nooksack Glacier is on the left. I call the Hummels to shoot the breeze at least once a week. Our conversations often begin with Jason, Josh, and I all involved in lively boasts and banter. Josh inevitably withdraws before long. Jason and I usually continue for some time. I lose my zeal, but Jason can carry a conversation by himself for quite awhile. In the end, Josh's disgust at our babble begins to stifle Jason, but even then the gab engine will sputter and backfire a few times before it is truly over. During one such episode last fall, I mixed a little more fuel and air for his combustion by mentioning a desire to ski the Nooksack Glacier. Not surprisingly, Jason (aka FatBoy) wasn't interested in the approach to Nooksack Cirque, so he suggested White Salmon Glacier as an alternative approach. Then the question occurred to him: Why stop there? Icy Peak and Ruth Peak were for the taking; he was all too familiar with the way to Hannegan Pass. So, from the sputtering death of our conversation came a lively bang, capable of rendering any muffler obsolete; it sounded like a plan that couldn't backfire. After a week working in Los Alamos on the ultracold neutron experiment, I wanted to escape. Jason was determined to see his vision materialize. My week was far too hectic between school, preparing for another week in Los Alamos after only eight days in the northwest, and arranging for the three-day Nooksack excursion that shortened my eight days at home to five. To top it all, I had a buddy from Texas, whom I hadn't seen for years, come into town the afternoon before our departure. Naturally, I felt that the only honorable thing to do would be to have some drinks with him. An evening of beer, cognac, stronger beer, more cognac, and cigars had me in an incomparable state of readiness. Estoy listo. I slept through my alarm, which helped me total an hour of respite by the time the Hummels disturbed me with their knocks. I staggered to the door, let the twins inside my apartment, and gathered my things. Before leaving I took a sip of water and tried not to feel too intoxicated. It was encouraging that I didn't have any trouble carrying my pack down the stairs. When I got there, I was surprised and honored to be greeted by none other than Lowell Skoog. No offense, Sam, I was happy to see you, too. I've thought it would be interesting to make tracks with Lowell for quite some time, but if I had my 'druthers I would have been fresh. I really didn't intend to drink as much as I did the previous night in the first place, but I might have exercised a little more self control in anticipation of chasing a seasoned veteran like Lowell. No offense to Jason, Josh, and Sam, but I guess I let myself slip a little after the debate about not wanting to leave Seattle until seven in the morning. Que va, seven in the morning! Bartender, dos mas cervezas! In all fairness, they did agree to leave at three, in the end. Juice, chips, and sleep during the ride with the Hummels to the Hannegan Pass Trailhead put me in a closer approximation to readiness. Blue skies and moderate temperatures promised a beautiful day. Sam got his truck stuck in the snow, but that was quickly remedied with plenty of hands available to dig and forage for sticks. Sam got a shuttle from some nice WSDOT employees so that he could park in the upper Mt Baker Ski Area parking lot, while still embarking from the lower lot. It was warm enough for a single shirt and no gloves by the time we started skinning up the cat track. From the bottom of the quad chair, we essentially made a descending traverse as cliff bands, gullies, and trees allowed until we reached the open valley floor. Lowell began with skins and harscheisen, for which he would be an effective salesman for the remainder of the trip. The rest of us booted until the crust became less dependable, then switched to skins. Lowell made efficient switchbacks up the White Salmon Glacier at an impressive pace. It was all the more impressive to the rest of us since the surface wasn't totally ideal and every few steps our skins would slip a little, sometimes more. I'll admit that I might have coveted Lowell's ski crampons. Nevertheless, the going was manageable without them; I've perspired away an honest night's drinking in far worse fashion before. I caught Josh and Lowell just below Winnie's Slide, not too long after the sun caught us. We took a decent break waiting for Sam and Jason, then we rested more in their company. I had no complaints; food, water, time, and rest were just the thing for my condition. At least I didn't have a headache. I departed before the others, anxious to make a solid geometric connection in my head between two previous experiences with Winnie's Slide. The first was stopping there as a high point when Ben Manfredi and I skied Fisher Chimneys, the second was not being able to get to it while Jeff and I were trying to descend after climbing the North Face last November. It looked to me like I might be able to traverse across it on my skis, so I began a rising traverse. As I progressed up the slope, the snow got a little too icy for comfort, so I did a short bit of booting. Lowell made the better decision to boot directly up the bulge; between that and me fussing with my bindings at the top of the slope I was once again relegated to the status of "follower." A quick traverse of the Upper Curtis Glacier led us to the base of Hell's Highway. There was clearly a lot of wind above us. It was also interesting how the wind carried a lot of really fine-grained snow, and the temperature was warm enough so that the snow instantly melted upon contact. 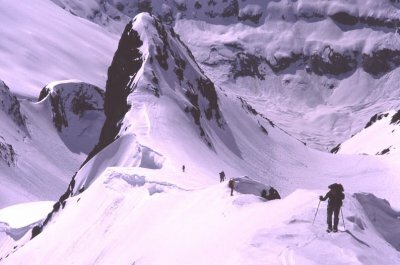 Lowell was the first to surmount the Sulphide Glacier, followed by Josh. I was less than enthusiastic to ascend into the full force of the wind, but it was inevitable and I found myself on the Sulphide Glacier just ahead of Jason and Sam. I could see a rock and dip in the glacier to the east,toward the Crystal Glacier, so I headed that way, where I expected to find Josh and Lowell. Jason and Sam stopped to make some gear adjustments. When I joined Josh and Lowell, I found them working on a snow cave. It seemed like a fine idea to make a shelter from the wind; I began working on a second entrance. We all took turns for about two hours until we had a respectable shelter. By the time we finished, we were exhausted and hungry, so the summit pyramid was postponed until the morning. Food and sleep were top priorities. Lowell and I were going to sleep on a long bench we had made. Jason and Josh slept in their tent in front of one entrance. Sam fussed with his tent for a short while, then took it down and decided to sleep on the floor of the cave. Things had gone fairly well to this point, but now they started to get ridiculously good. We all enjoyed a leisurely supper, which Sam and I followed with a few sips of Scotch and cognac. Then we slept for ten hours. In the morning we were elated to find the skies were blue and the wind had subsided. We skinned the icy morning crust to the base of the pyramid. Lowell began first with his crampons and ice ax. I followed with bare boots and two whippets. Jason was behind me, taking it to another level: bare tele boots and regular ski poles. There was only one spot where I felt the need to kick my toe into the ice for more of a platform than Lowell had left for me, only for a few steps. The lip exiting the gully to the summit ridge was quite interesting, more steep and less consolidated. An ice ax would have been nice, but a little wallowing and hands in the snow were adequate. 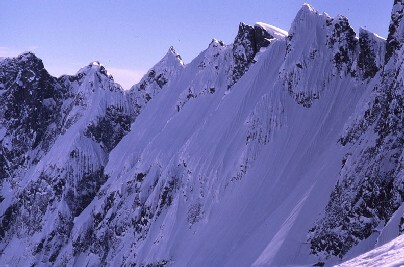 We left our skis for short rime-iced ridge to the summit. I was really happy to finally make the summit of Shuksan, after several trips on the Sulphide, a climb and ski descent of Fisher Chimneys, a climb and ski descent of the Price Glacier, and an ascent of the North Face. It was a joy to appreciate the massive, complex flanks of my intimate acquaintance from above. I will return. 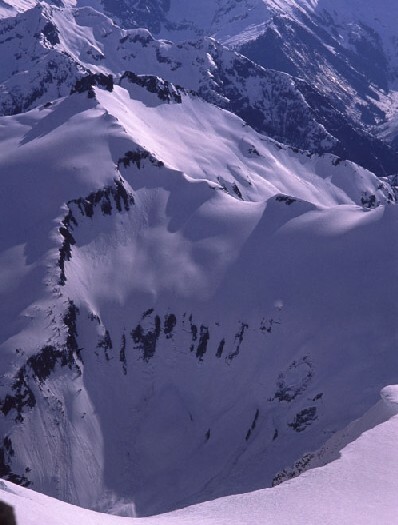 Next on the agenda: Look at Icy Peak and Nooksack Cirque. After plenty of gawking, we returned to our skis to enjoy the first of many descents to come. Jason dropped onto the slope first, making a few tentative turns. He stopped while I adjusted to take a photo. Sam went next, then Lowell, then Josh. I had taken enough photos and couldn't handle waiting for these guys to ski; I was drooling. I'd been wanting to ski the pyramid for a while. I traversed the lip and let it rip, carving all the way until I met Jason below the others. No one was in too much of a hurry back at camp. I used my stove to melt some water. It was nice enough that I could sit and enjoy the sun with no shirt. It occurred to me that I would like some photos of everyone at the camp, so I took a few steps away from the crowd and finished my first roll of film. In a brilliant display of stupidity, I wound the film backwards so that it didn't go into the canister. While everyone else began traversing the Crystal Glacier to get a look at the Nooksack, I went into the snow cave; I was cursing myself and hoping to unload my film inside a bag, inside my coat, without ruining it by exposing it to light. Luckily, I managed and the film was fine. It was an easy, quick traverse to the top of the Nooksack Glacier. I missed that fun moment where everyone mills aimlessly and heads get scratched, trying to decide where to go. I missed the even better moment where someone takes a look, makes an attempt, and finds that things look great. Not surprisingly, the person who made that discovery was Lowell. I had the pleasure of discovering for myself because I was late, and I was making a beeline for an ice cliff before everyone yelled at me. I would have got it. I mean, I had it figured out, I just wanted to be like Seth Morrison. Yeah, that's it. The Nooksack Glacier's headwall was fun. We had come prepared to make a belay and rappel the cornice or ski it on belay, if necessary. In the end, only a few steep turns put us in cruising terrain surrounded by the many wonders of Nooksack Cirque. Platitudes like "This is so cool," and "Wow, that's spectacular," became the only mode of conversation, and justifiably so. Not only did the entrance go easily, we were able to make a direct descending traverse all the way around the cirque, until we reached a nice spot in the sun where we could change gear to climb Icy Peak. I made the traverse quickly, ahead of the others. I took the luxury of removing all my clothes and boots to sit in the sun absolutely naked. There's nothing better than getting naked in high alpine terrain; I swear it's good for the soul. And it was definitely nice to let my feet dry. I enjoyed sitting there so much that I was almost the last to leave. Lowell led the way yet again. I followed Josh and Jason, with Sam guarding our hind quarters. I was well ventilated and ready for action, so I caught the twins quickly. There hangover was gone and I felt motivated. It only took a little bit of me stepping on their ski tails to convince them to let me pass. I was feeling feisty. I said something to Josh along the lines of, "I want to see about catching this Skoog character." I didn't quite sweat all my water reserves empty before catching Lowell. He had just reached the ridge leading toward Icy Peak. The southern slopes on the other side of the ridge looked a little too well-cooked. We agreed it would be better to stay on the ridge, but there was a fairly steep roll just ahead of us. I don't think Lowell was using his ski crampons. I took great pleasure in forging the switchbacks over the steep roll. On the other side of the roll the, wind was really howling and I had to zip my pants. With that small hesitation Lowell was in the lead again. We took a break just below the top of Icy; Josh, Jason, and Sam followed before long. Lowell showed us the gully that is the standard route up Icy Peak; Josh asked something about the other side. There was speculation that we might be able to ascend easily on the other side, after traversing through a notch just to the east of the summit. We rested for awhile, not really bothered by the periodical, ferocious winds that Lowell described as "booming thermals." Lowell led a traverse to the notch, where it looked so good that I proceeded to skin to within two steps of the summit after dropping my pack. The others were right behind me. We were all really excited to ski the Spillway Glacier. With much anticipation, I clicked into my Dynafits on the true summit, mindful not to slide backwards over a very large drop. The snow was a reasonable crust off the summit, which was actually quite enjoyable with no pack. We grabbed the packs and prepared to ski more. I think we were all unaware of the shocking surprise soon to come. I traversed to a patch of sunlight so that Jason could get a good photo. We had experienced decent-edging hard snow off the pyramid of Shuksan and soft corn on the Nooksack Glacier, but now came the real treat. I was amazed and delighted to feel the sensation of floating in six inches of powder as I accelerated over the convex slope onto the glacier. Oh my! Sam, Jason, and Lowell take a break. We descended in a chorus of hoots and hollers. I got spoiled by the powder; when I hit a slightly less desirable patch of snow, I had a face shot - I mean face plant. It was a leisurely traverse to the Ruth-Icy saddle with (Lowell and Sam) or without (Josh, Jason, and Sky) skins. After a little debate at the saddle, we all went with Lowell's intuition to camp just below it, on a flat area to the west. 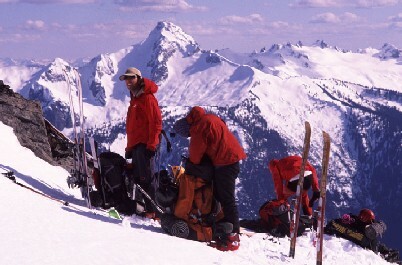 Jason negotiated with the quid pro quo that Lowell must take photos of him and Josh launching the cornice. I was a bit confused by the bargaining, but happy to take Lowell's advice. 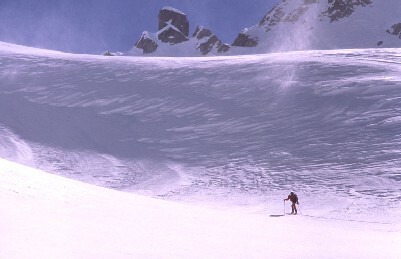 The Spillway Glacier was a spectacular ski. There were some clouds that evening. Lowell heard a Vancouver forecast on his radio, calling for clouds and sun. Personally, I was hoping it would rain. Everything had went a bit too perfectly. After so much perfection, something bad must happen. I'm writing this nearly two weeks later and I can't quit looking over my shoulder. I won't even tell you about the weather on the last day, because I'm already a nervous wreck! Ruth Mountain was a nice finishing touch. 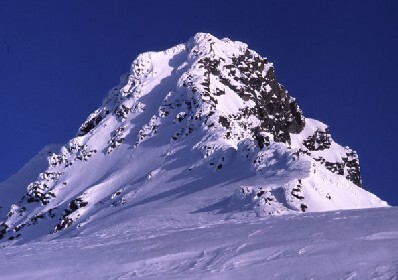 I skied that in 1974 with pins and leather, sucka.